Alexander joined Fraunhofer FIT in June 2013. In 2019, he finished his habilitation at the University of Siegen. He also holds a PhD from the University of Siegen as well as a Master in Cultural Anthropology from the University of Bonn. Alexander’s research is focused on developing interactive tools in the domain of environmental and consumer informatics in a broad range of application domains ranging from smart factories to private households, as well as on ethical and social implications of technology. Due to his interdisciplinary background, he is proficient in combining empirical research methods with user-centered and participatory approaches towards software development. Alexander publishes in research communities such as CSCW, HCI and Software Engineering. Martin Stein joined Fraunhofer in 2015. He studied business informatics at the University of Siegen. In the scope of his phd, he worked on different national and EU-funded projects. The focus of these projects included user-centered design, interaction concepts for mobility and design for older adults. Furthermore, Martin Stein conducted requirements analyses and usability studies in the scope of various industry projects. Since 2017, Martin Stein works as a visiting researcher at the Fraunhofer-Institute for Applied Information Technology FIT. Malte Paskuda joined Fraunhofer in 2017. He studied Computer Science at the TU Darmstadt, Human Computer Interaction at the University of Siegen and did a PhD at Troyes University of Technology, also in the field of HCI. Malte worked on a European research project creating a collaborative online platform, and studied the influence of social settings on behavior of people participating in such internet spaces. For those studies he analyzed interactions of people on existing online platforms with the help of machine learning. Tobias joined Fraunhofer FIT in Januar 2008 as a research fellow at Fraunhofer FIT’s group on user centered computing and Usability and User Experience Design. In his research he focuses on innovation in human computer interaction rooted in human practices. Tobias studied computer science and business economics at the University of Siegen and University of New South Wales, Australia. Tobias holds a PhD in Business and Information Systems Engineering from University of Siegen. He has led national and european research initiatives on user centered design and usability engineering. He led the SOCIAL MEDIA project focusing on the research and development of concepts and strategies of in-house information systems, including home energy information by using media devices in the home. Leonardo has been an associate researcher at Fraunhofer FITS since 2005 . He holds an engineering degree in Computer Science and M.Sc.Eng degree on Software Architecture from the Universidad Católica de Chile and a PhD from the School of Economic Disciplines of the University of Siegen in Germany. Leonardo was for 3 years holder of a Scholarship for postgraduate studies from the German Academic Exchange Service, DAAD. The research of Leonardo explores ways for providing digitally mediated information as a resource for building new practices. This includes the methodological world of building bridges between technical design and practices. The recent work of Leonardo focused on designing technology to support crisis management. In this context, Leonardo led the Domain Analysis efforts in the Bridge project. 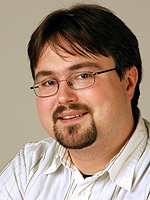 Sebastian joined Fraunhofer FIT in October 2006 as a research fellow. At FIT, Sebastian’s research interests were in designing transformations of social configurations. Recently, he has been in charge of the COMPOSITE project, leading the work package of technology adaptation. Prior to FIT, Sebastian worked as project manager for the design of mobile applications for top-brand clients. Sebastian holds a PhD in Industrial Design Engineering from TU Delft, Netherlands and graduated as Media System Designer from the University of Applied Sciences in Darmstadt, Germany. He has received scholarships from the German National Academic Foundation, the Mühfenzl Foundation, the e-fellows Foundation and worked as associate with the German think tank Stiftung neue Verantwortung. Matthias joined Fraunhofer FIT as a researcher in 2007. He holds a degree in Information Systems at the University of Siegen. As student he participated in several research projects related with mobility, location based services and situation awareness. In his research, Matthias explores the possibility of attaching knowledge to common life objects, augmenting them instead of just storing information about them. In this quest, a profound understanding of human practices and a respectful approach to the introduction of technology provide the guidelines for the creation of new practices and innovative forms of human-computer interaction. Tobias joined Fraunhofer FIT in 2004 as a student composing his final thesis on knowledge management in online communities. After graduating from college in 2005, he became research associate. He has worked in numerous national and European research projects with a focus on knowledge management. In his research, Tobias studies knowledge management practice in its broadest sense such as sensemaking practices of firefighters. Tobias also coordinated the landmarke project. He holds a degree in business informatics from University Siegen.